I got one short answer for the question of why medical device salesman hate their job: it's the boss. Yes, I can see some of them grinning already. And yes, this is not TOTALLY true because some of us got lucky with boss like an angel. Some of us don't though. The boss is more like boot camp trainer. The only difference is, the trainer is making the man or woman out of trainee but that boss is "scaring" the man or woman out of sales reps. I got countless visitors to this blog who seem to land after they searched for "why I hate my medical sales job" or something along those line. I swear I can write 100 pages e-book with all the keywords variations. I was pleased initially, because they end up on my blog. In fact, I've made a specific post to address the subject. And it's quite popular too! I don't want to give any attention to it since I thought it's just a passing search trend. Plus, I don't see why I should write something that could amplify the pain - more like rubbing salt to the wound. I'm fond of doing this with other issues but I try to contain myself from hurting my fellow medical reps. Being a medical device salesman already pose immeasurable pressure. Some people are like swelling balloon and they become so thin that a tiny-weeny poke can blow them up. They lose it easily. They got bosses pressure. Bosses were pressured from their bosses and so on and on. It's a long chain of command up to the single person - the boss of all bosses - who we'll got no chance to meet in person. Just video wish and blog post, maybe. Oh! Do you know that the trust level are higher for companies leaders who communicate openly through social media? Managing the boss is a high pressure job. Pressure is better known as stress, in real life. Stress is a precursor to so many lifestyle disease, especially high blood pressure. If we think about it, hating something that causes you trouble is not wrong at all. You hate it, and you do all you can to fight, minimize or keep it at a distance. There's nothing wrong with that. 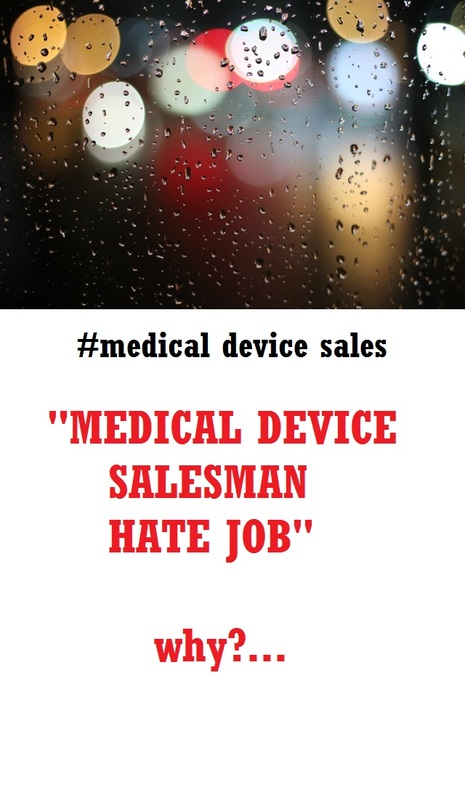 That's mean, there's nothing wrong in hating medical device sales job, right? Who like job that stressed them out? That also means, it's OK to hate the boss, right? After all, the job would be just nice if the boss does not come after reps every now and then, right? This could be one of the reasons, but it's more of an excuse. Let's just leave them behind and move on before they came back to bite us. Some medical device reps do hate their companies. There are many reasons for that. They said companies do not pay them enough, companies are not taking care of their welfare, companies cheat them in incentives and perks, and thousands other reasons why they hate the jobs because of the companies. I used to think that way too and I listed close to 10 major reasons why company was not being fair to me. How can company assign an "imbecile" to manage me? How come I miss getting my pay rise every year? How come my sales target is higher than others? No wonder I hate this job! Think carefully now, especially all of you "medical device salesman" out there. I don't know whether you're a rep or not, but I really think that we all could use a career revisit. As medical sales rep, go back to when you first started. What causes you to join medical sales industry? Maybe you said that you don't have a choice, but I believe no company put a gun to your head to join in, right? If you find the job does not suits you while you're at it, what stops you from making career change, company change or any kind of change for that matter? No one force you except, of course, YOU. If you stay up to this stage, and I know some medical device salesmen who stay up to 20 plus years or more, what keeps you going? It's probably insane to keep something that harm you. It's just like raising a Bengal tiger to its full size and then it will eat you later. NO! There must be something beyond money or position that drives you. I wish you can share it with others here because I've seen more benefits of enjoying medical device salesman job than hating it. There's no point in hating medical device sales even for the right reason.